In April 1944, General Douglas MacArthur’s Southwest Pacific forces took a giant 600-mile leap along the north coast of New Guinea with their landing at Hollandia. That invasion took the Japanese completely by surprise, and most of the few Japanese present near the invasion beaches melted into the jungle. The Hollandia operation cut off the Japanese 18th Army in northeast New Guinea. MacArthur’s air commander, Lt. Gen. George C. Kenney, needed forward airfields in Dutch New Guinea to pave the way for a return to the Philippines, scheduled to take place near the end of 1944. It was hoped that the Hollandia area would provide those airfields. But the ground proved too soggy for Kenney’s big B-24s; new airfields west of Hollandia would have to be found. Consequently, MacArthur used the U.S. 163rd Regimental Combat Team to invade the small island of Wakde, 120 miles west of Hollandia, on May 17. They captured the island after stiff resistance. 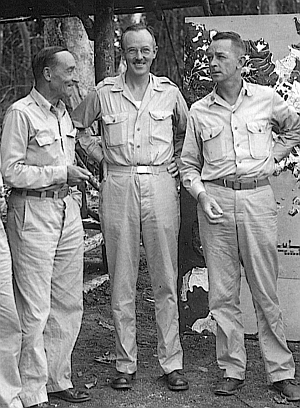 Brigadier General Horace Fuller (left) of the 41st Division confers with two of his staff officers. Wakde’s cramped operating conditions were also insufficient to meet Kenney’s needs and would prove disastrous in early June when Japanese air raids wrecked a large number of Fifth Air Force aircraft on the ground. Accordingly, Kenney was anxious to obtain the excellent airfields at Biak, a coral island 180 miles west of Wakde and 300 miles west of Hollandia. Biak was the best airfield site between Hollandia and Mindanao, a major island of the Philippines, and its coral surface would enable big bombers to operate without difficulty. The island is approximately 45 miles long by 20 miles wide and the Japanese had already recognized its usefulness, completing three airdromes there by May 1944. On April 28, B-24s of the 43rd and 90th Heavy Bombardment Groups, flying from Nadzab in eastern New Guinea, struck Mokmer airdrome on Biak in the first big daylight raid designed to soften up the island’s defenses. This was followed by additional raids against the island by both the V and XIII Bomber commands during May. These raids hit gun emplacements, supply concentrations, and airdromes, and Japanese aerial opposition over Biak, though fierce at first, faded away entirely after the first week of May. The job of seizing Biak was given to the Hurricane Task Force commanded by Maj. Gen. Horace H. Fuller. This task force initially would consist of the U.S. 162nd and 186th Regimental Combat Teams, with the 163rd RCT in reserve. These fighting units belonged to Fuller’s 41st Infantry Division, which had never before fought as a full division, but rather as individual combat teams, as exemplified by the 163rd’s capture of Wakde. Biak would be a test of Fuller’s ability to coordinate operations of a large number of troops—the Hurricane Task Force totaled about 28,000 men, including service and support units not integral to the 41st Division. Z-day was to be May 27, 1944. As task force commander, Fuller reported directly to Lt. Gen. Walter Krueger, commander of the U.S. Sixth Army and Alamo Force, who in turn answered directly to MacArthur. Lieutenant General Robert L. Eichelberger, commanding the U.S. I Corps, remained at Hollandia and had no initial responsibility for Biak. MacArthur had pledged to support Admiral Chester W. Nimitz’s Central Pacific forces’ invasion of the Marianas from Biak’s airfields. Nimitz’s landing on Saipan was scheduled for June 15. This meant Fuller would be under intense pressure from Krueger and, indirectly, MacArthur, to complete the capture of Biak’s airdromes as soon as possible. Inexplicably, however, Fuller failed to inform his regimental commanders of the need for speed. All of the airdromes were located on Biak’s south coast, so on paper the operation did not look particularly difficult. Krueger selected a landing site near the town of Bosnek, east of the airdromes. It appeared that Fuller’s men could push along the coast road to seize the first field, Mokmer drome, without great trouble, thereby allowing engineers time to regrade and improve the field sufficiently to handle the B-24s needed to support Nimitz. But little was known about the true state of Japanese defenses on the island, since pre-invasion reconnaissance had been scanty. Fuller was unaware that he would be walking into a trap. To the Japanese Imperial Navy, Biak was crucial. Its airdromes were needed to provide support for the Imperial Navy’s grand design, Operation A-GO. That plan, formerly known as the Z Plan, envisioned the Imperial Navy luring the U.S. Pacific Fleet into a decisive confrontation within range of Japanese land-based airpower. On May 11, Vice Admiral Jisaburo Ozawa, commanding the First Mobile Fleet at Tawitawi in the Philippines, was alerted for the imminent launch of A-GO. If Biak fell into MacArthur’s hands, Kenney could use its airfields to fatally disrupt Japanese fleet and air movements implementing A-GO. Therefore, the Imperial Navy was prepared to make a major effort to retain control of Biak, including using its biggest battleships, Yamato and Musashi. The Imperial Army, on the other hand, had decided by May 1944 that Biak would be defended only as an outpost, no longer a part of its primary defense line in Dutch New Guinea. This meant that Biak would be held as long as possible, but sacrificed if necessary as part of a grand delaying action aimed at preventing MacArthur’s return to the Philippines. Defending the island was the Army’s Biak Detachment under the command of Colonel Naoyuki Kuzume, plus naval troops. The Biak Detachment was built around the 222nd Regiment of the 36th Division, a crack unit with combat experience in China. By May 27, there were 12,350 Japanese personnel on Biak. But MacArthur’s G-2, Brig. Gen. Charles A. Willoughby, estimated there were only 5,625. Willoughby assessed that Hurricane Task Force would encounter “stubborn, but not serious, enemy resistance” on Biak. Unknown to Willoughby, Fuller, or Krueger, the defenders of Biak anticipated an Allied landing, and Kuzume had by late May erected a formidable defensive network on the island. As the 41st Division history recounts, Hurricane Task Force’s principal area of operations would be “bounded by an almost unbroken ridge of … narrow, terraced, coral reef, which in places rises to 330 feet on the ocean side and 160 feet on the landward side. The reef is covered with tall rain forests and frequently is made up of parallel ridges which serve as additional obstacles in terrain already quite difficult.” Within this favorable topography, Kuzume established extensive cave networks that would provide more than adequate means of subjecting any American push down the coast road to a withering fire. If the Americans somehow reached Mokmer airdrome, Kuzume could render it unusable by directing heavy fire onto that as well, from positions located in caves just above the drome. All told, Hurricane Task Force’s mission would prove more difficult than any of MacArthur’s operations since the bloody conquest of Buna in Papua, nearly a year and a half before. Fuller’s landing force left Humboldt Bay (Hollandia) on May 25. Fuller hoped at least for tactical surprise, and to some extent he got it, even though Japanese reconnaissance aircraft sighted Rear Adm. William Fletcher’s invasion fleet 24 hours before the actual landing. LCI ships unload infantry at a makeshift wharf along the Biak shore. The morning of May 27 broke bright and sunny as the first wave of Fuller’s troops headed toward shore at 7:15, preceded and accompanied by a massive Allied air and naval bombardment. Three American light cruisers, Phoenix, Boise, and Nashville, fired a total of a thousand 6-inch rounds into the airdrome sector, while destroyers pounded the landing beaches near Bosnek. Fifteen LCIs (Landing Craft, Infantry) and 25 DUKWs (amphibious trucks) transported the first four waves of infantry. These vehicles had to negotiate a substantial offshore reef, and the pre-invasion bombardment left a pall of smoke over the beaches that obscured the selected landing points. At 7:30, the 2nd Battalion, 186th Infantry was the first unit to hit the shore. It was supposed to land near Bosnek but, because of the current and bad visibility, the entire battalion landed in a mangrove swamp near Mandon, two miles west. The battalion nevertheless moved inland until it reached the coast road. It was soon joined by the 3rd Battalion of the 186th, and the two battalions reached their respective initial objectives by noon without difficulty. The 162nd Regiment, meanwhile, which had been assigned the task of taking Mokmer airdrome, landed to the east of the 186th, and had to pass through its positions in order to take the lead down the coast road. At first, opposition was light, and by midmorning Hurricane Task Force’s supporting artillery and Fuller’s task force headquarters were both ashore and in position at Bosnek. The Japanese first offered organized resistance at the Parai Defile, about four miles west of Bosnek. From a vertical coral and limestone cliff, a small number of Japanese defenders were able to hold up the American advance for several hours, until tanks and naval gunfire succeeded in driving them out of their excellent defensive positions. By nightfall on Z-day, the 162nd’s 3rd Battalion had established itself midway between Parai and Mokmer Village, well on the way to its objective of Mokmer airdrome. The 2nd Battalion held positions around Parai jetty, just to the east. The 186th RCT had expanded its beachhead around Bosnek and was probing the rough terrain north of the town, meeting limited resistance. The unloading of supplies and equipment at Bosnek went exceptionally well, and by nightfall 2,400 tons of bulk cargo, 12 medium tanks, 28 howitzers, and 500 vehicles had been landed. On the afternoon of Z-day, the first Japanese fighter aircraft appeared over the Bosnek beachhead. P-47s of the U.S. 342nd Fighter Squadron intercepted the raiders, shooting down five while losing one of their own. Between May 27 and June 3 the Japanese mounted 10 air raids against the beachhead but achieved negligible results. The Imperial Navy’s air arm was slightly more successful operating against the ships offshore, strafing the LSTs (Landing Ships, Tank) unimpeded for over an hour on June 2 and badly damaging the U.S. destroyer Kalk on June 12. But overall air reaction to the Biak landing was surprisingly ineffective, and by mid-June the attention of the Imperial Navy and its air force had shifted northward to counter Nimitz’s move into the Marianas, resulting in the disastrous (for the Japanese Navy) Battle of the Philippine Sea. Contrasting with the limited air reaction, however, was the seaborne threat posed by the Imperial Navy. On May 29, Imperial General Headquarters had approved the Combined Fleet’s Biak reinforcement plan, code-named Operation KON. As part of that plan, the Combined Fleet intended to “seek an opportunity for Operation [A-GO] by carrying out this operation and inducing the enemy task force to come out.” The Japanese were now looking to fight their decisive naval battle off western New Guinea. The date for delivering reinforcements to Biak was June 3. On May 31, Krueger’s Sixth Army Intelligence Section stated flatly: “Enemy naval intervention at this stage of the [Biak] operations is impossible.” But this assessment proved fundamentally incorrect. Willoughby knew from ULTRA intercepts that the Japanese were at least planning to move the Imperial Army’s 2nd Amphibious Brigade from Davao in the Philippines to Biak. Wishful thinking nevertheless led to the conclusion that a major naval counteroffensive was unlikely. ULTRA allowed U.S. Navy patrol aircraft operating from Wakde to anticipate the movements of the KON force, and the Japanese knew they had been discovered well before reaching Biak. Accordingly, Admiral Soemu Toyoda, commander-in-chief of the Combined Fleet, suspended the operation on June 3. But he reactivated KON the next evening. Opposing the renewed effort would be a small Allied force under Rear Adm. V.A. Crutchley, Royal Navy. 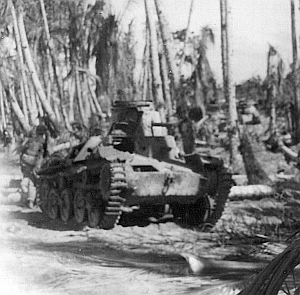 A Japanese tank, knocked out in the Biak fighting. LVTs of the 2nd Engineer Special Brigade succeeded in getting supplies to Roosevelt and evacuating his wounded. The 3rd Battalion was forced to withdraw along the beach, but could do so only when a combination of air, naval, and ground artillery finally silenced a substantial number of Japanese weapons that had kept the Americans stymied most of the day. Fuller was so distressed over these developments that he radioed Krueger on the afternoon of May 28, requesting that he be reinforced immediately with the 163rd Regimental Combat Team and an additional engineer battalion. In the first two days of fighting on Biak, the 2nd and 3rd Battalions of the 162nd had already suffered casualties of 12 percent of their engaged troops. The next day Kuzume launched three independent counterattacks against the 162nd using nine tanks in support of the infantry. This was the first time MacArthur’s troops had encountered Japanese armor after two years of fighting in New Guinea. But the Japanese tanks were no match for the American Shermans, which knocked them out with the support of naval gunfire and aerial bombardment. The Japanese did succeed in cutting off some forward American troops, but a determined counterattack by two companies of the 162nd dislodged the Japanese and by the end of the day the 162nd alone had killed 400 more enemy troops. Fuller had by then learned, however, that he could not expect to seize Mokmer airdrome by simply pushing down the coast road. He also needed to occupy the high ground to the north, which would require sending a force over the ridges at a point well east of the fortified Japanese positions near Mokmer. In preparation for launching such a concerted effort, the entire 162nd Regiment pulled back toward Mandon, covered by a platoon of tank destroyers. Fuller awaited the arrival of the 163rd RCT before resuming the attack. On June 1, the 163rd arrived at Biak and assumed the defense of the Bosnek beachhead, freeing the 186th Regiment to advance over the ridges north of the town. On June 2 the 186th turned westward, moving across the inland plateau with the objective of coming in behind the Japanese overlooking Mokmer airdrome. Lack of water proved to be a problem, with the 186th’s troops “limited to three canteens per man for the four-day advance in stifling heat.” All supplies to the 186th’s units advancing inland had to be hand-carried over the ridges with considerable difficulty. Owing to the terrain and heat, the regiment made slow progress, though enemy resistance was light. Brigadier General Jens Doe confers on the beach with Lieutenant Colonel Miller. Krueger had sent observers from his staff to Biak as soon as Fuller ran into trouble. These observers noted a variety of deficiencies, most importantly the fact that American reconnaissance was so poor the troops did not know exactly where the Japanese were located. Additionally, “so few members of the task force staff had visited the front lines that General Fuller could not possibly have obtained complete and accurate information concerning the fighting.” In early June, Krueger considered relieving Fuller and replacing him with Eichelberger, but deferred that decision for nearly two weeks. Meanwhile, on June 2, a company of the 163rd had seized Owi Island, two miles off the south shore of Biak, to be utilized as an alternative to Biak. Engineers began work at Owi on June 7, and the first planes landed there on June 17. But Owi soldiers suffered an outbreak of scrub typhus, which soon spread to Biak and caused serious illness in a large number of Hurricane Task Force troops. As the 186th Regiment, plus the 2nd Battalion of the 162nd, made its laborious drive westward across Biak’s inland plateau, the rest of the 162nd began another advance down the coast road toward the airdromes. Fuller was now using regiments in the way he initially had envisioned using battalions. Once again, the 162nd’s progress was blocked by strong Japanese resistance at the Parai Defile, where the cliffs come within 50 yards of the coastline. On June 3, Roosevelt’s 3rd Battalion of the 162nd was forced to withdraw again on account of intense enemy fire, and all efforts over the next three days to force an advance through the defile failed. Finally, on June 7, the engineers, using amphibious craft, carried elements of the 3rd Battalion around to Parai jetty. The Parai Defile was not cleared of Japanese until June 12. The 186th had been able to advance 3,500 yards on June 3 against only occasional sniper fire, but owing to thick growth that reached 12 feet high the troops’ visibility was limited to about 10 yards. The 186th spent several days reconnoitering the trails leading over the ridges toward Mokmer airdrome. Fuller was by this time under ever-greater pressure from Krueger to capture Mokmer drome as soon as possible. He ordered Colonel Oliver P. Newman, commanding the 186th, to send his troops directly over the ridges and onto the airfield from the north, despite the fact that this move would expose Newman’s men to enfilading fire from the Japanese, who still held positions along the ridges overlooking Mokmer airdrome. “We are going to catch hell,” Newman remarked, as he objected to Fuller’s order and was supported in his objection by Fuller’s Assistant Division Commander, Brig. Gen. Jens Doe. Fuller overruled the objections, and the 186th crossed the ridges and occupied the airfield on June 7. Indeed, Kuzume’s men poured heavy automatic fire down on the unfortunate Americans for four hours before counterbattery fire finally silenced many of the Japanese guns. They were determined to recapture the airdrome and probed the American positions after dark, even utilizing trained dogs. By this time, Kuzume’s defenses were split into three widely separated strongholds. North of Bosnek he had his headquarters plus one battalion of the 222nd Regiment. The East Cave sector between that position and Mokmer was held by elements of two battalions and service units. In the very strongly held West Cave sector (also known as The Sumps), Kuzume had most of one battalion plus airfield construction units, other service troops, and naval troops. At Mokmer airdrome Kuzume’s hand was forced on June 9 by Lt. Gen. Takazo Numata, chief of staff of 2nd Area Army, who was trapped on Biak during an inspection visit May 27 and was therefore the ranking Japanese officer on the island. Despite generally leaving operational matters to Kuzume, Numata insisted on using all available units to retake the airfield, and assumed personal command of the troops in the West Cave sector. Shortly before dawn on June 9, the 2nd Battalion of the 222nd attacked and eventually fought halfway across the airstrip before being stopped by American fire. A company of naval troops succeeded in infiltrating completely across the airstrip, reaching the coast in the American rear, but could not maintain this position and had to withdraw west of the airfield. The Japanese continued to pummel Newman’s troops with heavy fire from the heights, but Numata’s major counterattack to retake Mokmer airdrome failed. Numata himself left the West Cave position on the evening of June 10 to return to 2nd Area Army Headquarters at Menado in the Celebes, leaving Kuzume in charge once again. While the 186th suffered its ordeal at the airdrome, the 162nd continued its operations to reduce enemy positions in the Parai Defile. By June 10, a linkage was established between the 186th’s position at the airdrome and the 162nd’s units to the east. U.S. Army construction engineers arrived at Mokmer drome on the night of June 9 to improve the runway, but found themselves under constant fire from above, and on June 14 they suspended all work on the airstrip until combat conditions allowed a resumption of activity on June 20. Despite firing over two thousand 5-inch rounds at the fleeing ships, all five Japanese destroyers escaped; however, several of their troop-carrying barges were cut adrift, and one was sunk by an Australian destroyer. A small number of Japanese troops managed to land at Korim Bay on the east coast of Biak. Most of the troops in the convoy, however, returned with the destroyers to their base at Sorong on the Vogelkop Peninsula. A third attempt at KON would be needed. For that attempt, Admiral Ozawa’s big battleships were finally to be committed to action. Vice Admiral Matome Ugaki, Ozawa’s battleship force commander, took personal charge of KON-3, and by June 11 everything was ready at Batjan in the Moluccas to begin the operation. Included in Ugaki’s directive from Combined Fleet was the instruction not only to reinforce Biak but also to engage in a major fleet action “if the situation permits.” But two days later, KON-3 was canceled, and the Imperial Navy’s Biak reinforcement attempts ended forever when its attention was diverted to events in the Central Pacific. Kuzume, however, did receive a trickle of Army reinforcements into Biak, beginning the first week of June. These troops arrived by barge and small craft from Vogelkop and Noemfoor Island. Kuzume made good use of them, but their numbers were too small to affect the battle’s eventual outcome. The most he could hope to achieve was delay, not defeat, of the Hurricane Task Force. In this he was successful. Fuller was increasingly feeling the pressure. He came up with a plan to sweep the Japanese from their ridge positions above Mokmer airdrome while simultaneously moving on the two airdromes west of Mokmer. Unfortunately, this plan was too ambitious to complete during the second week of June. Subsequently, MacArthur fired off a radio message to Krueger on June 14: “The situation at Biak is unsatisfactory.” That finally forced Krueger to take decisive action, and he summoned Robert Eichelberger from Hollandia to take charge of the Hurricane Task Force. Krueger envisioned that Eichelberger would now hold the top command at Biak but that Fuller would continue to serve as 41st Division commander. Fuller, however, had had enough, and demanded immediate relief from all his responsibilities and transfer out of MacArthur’s theater. He vowed never to serve under Krueger in any capacity again, upset over Krueger’s aggressive questioning of his intentions during nearly three weeks of operations on Biak. MacArthur granted Fuller’s request, and the relieved Hurricane Task Force commander ended the war as deputy chief of staff in Admiral Mountbatten’s South East Asia Command. A Sherman tank crests a ridge as members of Company A, 186th Infantry Regiment move forward in two columns behind it. Most of the 186th Regiment attacked the West Cave position from the northwest, while one of its battalions attacked from the east and the 162nd engaged in a holding attack in front of the caves. The arrival on Biak of the 34th Infantry Regimental Combat Team from the U.S. 24th Division on June 18 also enabled Eichelberger to execute Fuller’s plan of seizing Borokoe and Sorido airdromes west of Mokmer. Eichelberger’s operations’ officers repeatedly flew over the Japanese positions at low altitude in unarmed observation planes to locate the enemy’s cave entrances. The caves proved too deep for the effective use of flamethrowers, so Eichelberger’s men placed dynamite charges in them to kill the occupants with concussion. With the reduction of the Japanese cave positions above Mokmer airdrome, the airstrip finally became usable, and P-40s and B-24s began operating from Mokmer on June 22. The 34th RCT took Borokoe and Sorido airdromes without difficulty. But all of this was too late for MacArthur to meet his obligation to Nimitz of supporting the Marianas operation from fields on Biak. Fortunately, such support didn’t prove necessary. Resistance in the East Cave sector and in the Ibdi Pocket between Bosnek and Mokmer continued for some time after the fall of the West Caves, but by the beginning of July the battle had entered the mopping-up stage. Looking back, Biak ranks as the most frustrating operation undertaken by MacArthur’s troops during the last two and a half years of the war. Eichelberger was called upon to correct a confused situation, much as he had been at Buna in 1942–1943, and he succeeded admirably. 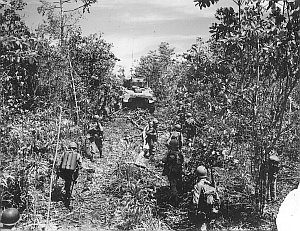 But after the easy success of Hollandia in April, the fierceness of Japanese resistance at Biak came as something of a shock to MacArthur’s troops. Krueger officially declared the Biak operation terminated on August 20, though patrolling on Biak and neighboring Soepiori Island continued thereafter. American casualties through August 1944 totaled 530 killed, 2,570 wounded, and 54 missing. More than 6,000 additional American troops became casualties from scrub typhus and other diseases. As of the end of August, 4,970 Japanese had been killed and 319 captured. In the end, Biak was a victory for the Americans. But the battle there proved an ominous portent. It foretold the kind of cave-based devastating defensive tactics the Japanese would use at Peleliu and Iwo Jima. Moreover, MacArthur’s forces could expect their return to the Philippines to be opposed with a similar, grim determination.